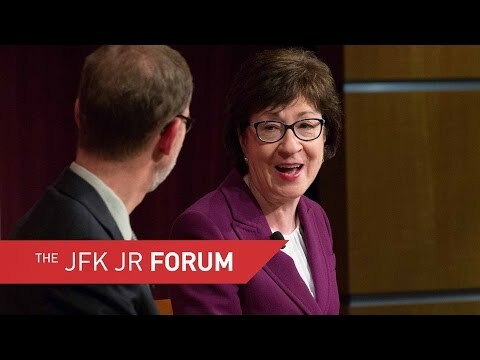 Harvard Kennedy School Dean Douglas Elmendorf moderated a conversation with Maine Sen. Susan Collins Thursday night, following a full day of lab tours and later meeting with students from Maine. Moderated by HKS Dean Douglas W. Elmendorf, the hourlong talk often brought out Collins’ differences with the current GOP. Yet she noted that she still sees herself as a traditional New England Republican. Prior to the HKS talk, which ended her day on campus, Collins toured labs to learn more about Harvard research, meeting with Kit Parker, Tarr Family Professor of Bioengineering and Applied Physics, whose work ranges from bioengineered wound dressings to traumatic brain injury. In talking with Associate Professor of Stem Cell and Regenerative Biology Chad Cowan at the Sherman Fairchild Lab, Collins focused on Cowan’s work with metabolic diseases such as type 2 diabetes. Collins also spent time with Harvard University students from Maine, and met with members of campus GOP clubs before taking the stage with Elmendorf. But in response to a student question, she said that she does not support Hillary Clinton either, due to her deleted emails and allegations of peddling influence in the Clinton Foundation. The winning candidate needs to work quickly to win public trust, Collins said. In the night’s toughest question, Collins was asked why she, as a supporter of Gold Star families, voted to authorize the Iraq invasion. Collins also recalled a personal encounter that helped inspire her life in politics. As a high school senior she traveled to Washington and met Sen. Margaret Chase Smith, a Maine Republican. In her new book, “Weapons of Math Destruction: How Big Data Increases Inequality and Threatens Democracy,” Cathy O’Neil, Ph.D. '99 argues that the algorithms dictating so many aspects of modern life are encoded with opinions and biases disguised as empirical fact, inflicting harm right under our noses.